Celebrate New Year’s Eve with a venue pairing! 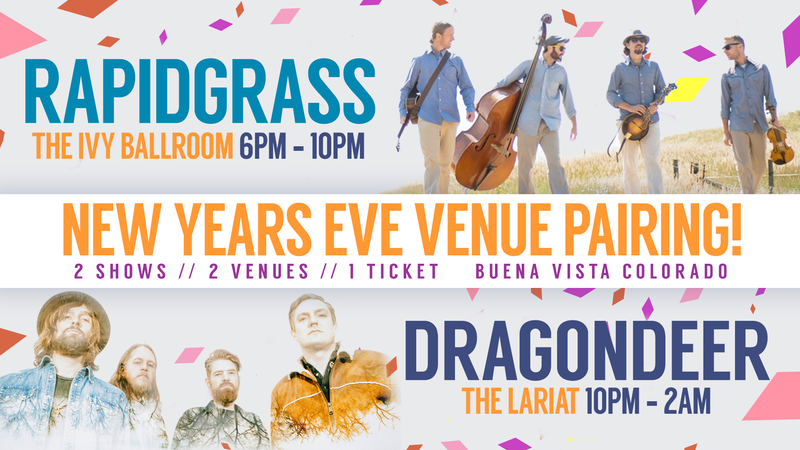 This unforgettable event showcases not one but two bands; Rapidgrass and Dragondeer. Experience, one of Colorado’s newest and one of Colorado’s most historic music venues. Nestled in the heart of the Rocky Mountains, both destinations have partnered to offer you one unforgettable evening. The ‘first course’ begins at 6 pm with Rapidgrass. Commemorate the New Year early with a New York champagne toast at 10 pm. A brand new, boutique concert venue in Buena Vista, Colorado. This special place is quite possibly where you’ll encounter your most memorable concert. Surrounded by beauty, Ivy Ballroom overlooks the surf waves on the Arkansas River and is flanked by an enchanting courtyard and fireplace. Expect exquisite; Brown Note Productions designed our custom sound and lighting system and it rocks! Let the music feed your soul and our in-house restaurant, Wesley & Rose fuel your belly. Enjoy farm-fresh fare and craft cocktails all night long. Cheers! The ‘second course’ begins at 10 pm with Dragondeer. Bring in the New Year with a champagne toast at 12 pm MST.